Since the publication of the second edition of this highly acclaimed textbook, telecommunications has progressed at a rapid rate. Major advances continue to occur in mobile communications and broadband digital networks and services, sophisticated signal processing techniques are prevalent at increasingly higher bit rates, and digital systems are widespread. These developments need to be addressed in a textbook that bridges the gap in the current knowledge and teachings of telecommunications engineering. 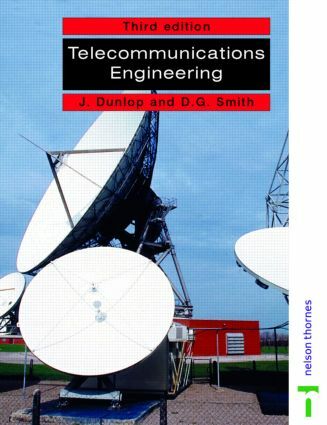 Telecommunications Engineering, 3rd Edition offers an introduction to the major telecommunications topics by combining an analytical approach to important concepts with a descriptive account of systems design. Completely updated and expanded, this third edition includes substantial material on integrated services digital networks, mobile communications systems, metropolitan area networks, and more. Supplemented with worked problems, numerous illustrations, and extensive references to more advanced material, this textbook provides a solid foundation for undergraduate students of electrical, electronic, and telecommunications engineering.